I’m no stranger to the 2018 Honda CR-V. After sampling the 1.6 SX Diesel last year, I loved it. It may not be the most beautiful looking or fastest compact crossover out there, but it’s certainly the best all-rounder. It has comfort, flexibility, frugality—key attributes that would normally be on top of a would-be buyer’s list. It’s so good that I named it as my Top Pick of 2017. Driving it on everyday (i.e. city) roads is one thing, but seeing how well it performs on an out-of-town road trip is another. Fortunately, Honda Cars Philippines gave me (and some fine hacks in the motoring beat) the chance to stretch the CR-V’s legs from Manila to Bagac in Bataan and back. And like any new experience, I got to learn 6 new things about the 2018 Honda CR-V.
As a car reviewer, I spend a considerable amount of time behind the wheel. Sometimes, I do get the chance to look at a car’s design closely during a shoot, but for the most part, the only way I truly appreciate its lines is either when I see my own reflection as I pass by a building, or when I happen to see another identical car on the road. During this drive however, I spent the vast majority of the time either glancing at the front of a White Orchid Pearl 1.6 S or staring at the rear of a Passion Red Pearl 1.6 SX; and this got me thinking: Honda designers probably used a Storm Trooper as reference. Coincidence or not, the front maw, with its liberal use of vents, grilles, and ducts nails the look of Star Wars’ imperial foot solider. Ditto for the back end, where the high-set lights and angular cuts seem inspired by the Storm Trooper’s permanently scowling face mask. On paper, things don’t bode well for the CR-V. With just 120 horsepower and 300 Nm of torque, some naysayers were quick to judge that it’s slow. In reality though, I find the power more than enough. It doesn’t deliver a surge of power like a typical diesel would for sure, but it’s enough to maintain a good amount of speed on the highway without getting caught for speeding. Oh, and it manages to hit 17 km/L easy during this drive which is crazy good. What I’ve learned though is that while the CR-V does have a commendable engine, its sprightliness probably comes more from its 9-speed automatic. In-gear acceleration could certainly use some improvement, but the gearbox’s quick and decisive nature masks the relative weakness of the engine. Migrating to an all-new platform (shared with the Civic) for this generation, the CR-V manages to live up to expectations set forth by its name: Comfortable Runabout Vehicle. Honda engineers have done all sorts of voodoo magic including the use of fluid-mounted suspension bushings and low friction dampers; the end result of which is a nice, serene ride on- or off-road. It’s surprising how I could go just a little bit faster on the rough stuff without causing my passengers to be thrown about the cabin. 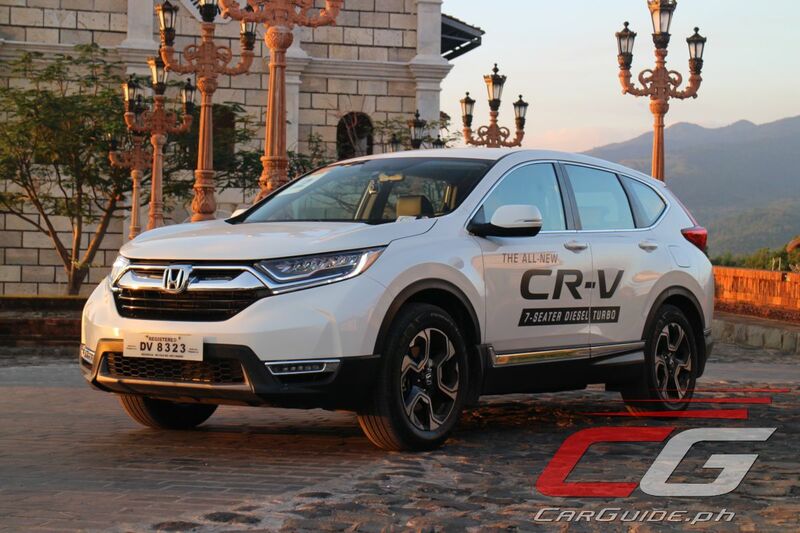 Honda is taking safety seriously and the all-new CR-V just got awarded with a perfect 5-star rating from the ASEAN New Car Assessment Program or NCAP. Of course, the top-of-the-line 1.6 SX takes thing further. Fitted with Honda SENSING, it gets features such as Adaptive Cruise Control (ACC), Lane Keep Assist (LKAS), and Low Speed Follow (LSF). The first two were particularly useful during the long stretches of SCTEX going to Bataan, Subic, and then back to Manila. It takes some time to master ACC and LKAS because it needs several presses of various steering wheel buttons, but once I got used to it, it becomes second nature. Another novel feature which later became invaluable is the Lane Watch camera. Although I still would prefer blind spot indicators, Lane Watch pretty much eliminates blind spots on the right side thanks to a camera installed on the side mirror. When activated, it displays an image of the right side’s blind spots onto the infotainment display. Perhaps the biggest surprise on the 2018 CR-V (at least for the sole AWD model) is that it can actually do a decent job at off-roading. While the track set up at Las Casas Filipinas de Acuzar is limited to just loose gravel, mud, and sand, I could actually feel the Real-Time All-Wheel Drive do its job to keep the CR-V moving forward. It’s worth noting that for this model, Honda has beefed up the AWD system to send 10 percent more engine torque to the rear axle (maximum split is 60 percent front, 40 percent rear) compared to its predecessor. While it still won’t replace a ladder-on-frame SUV with locking differentials or even crossovers with all sorts of specialized off-road modes for that matter, the CR-V’s “get in and forget about it” is more than enough for most city slickers whose main “off-road” obstacle would be going up curbs. Honda’s work on the 2018 CR-V doesn’t just start and end with the mechanicals; they’ve managed to craft a nice, easy-to-use interior as well. Recognized by Wards Auto as having one of the 10 Best Interiors last year (a list that includes the Bentley Bentayga and Lexus LC 500), the CR-V was praised for having an “upscale, clean, functional and supremely well built” interior. Above all, the cabin is also extremely flexible offering not just one of the largest cargo spaces in its class (473 liters with the third row folded and 972 liters with the second and third row folded), but a multitude of storage options as well. In addition, it offers all the useful road trip niceties such as USB charging ports and aircon vents for all three rows. Whatever happened to the Honda of the 90's which made cars with great engines. Now they only seem to produce cars with mediocre ones. Don't buy Honda. They're short selling Filipinos. It's clear they're trying to fool us. 120 hp in all variants, really? Entry level spec that's ok but another 200k to the next level for the same puny hp and the 4x4, too? Jesas Chrrrist. Despicable. They must've learn their tricks from Isoso. More profits through swindling, that's really despicable. How much more would a turbo'd 160hp of the same engine cost them probably 15k to 20k more. But they choose to put that into their pocket. drive it, it probabaly wont go as head to head as the bug suvs going aroung 160-180kph sa highway, but do you really need it? sa market ng CRV..city slickers, short distance rides for the urban setting with occassional out of town trips..its enough..
do you even know the negative effect of overtuning an engine? or using the turbo? kaya naman taasan eh..kaya naman more hp and more torque..but do you know the drawback? Guys like you makes the Japs proud of what they're doing. Galit ako sa 120 hp? And what, you're happy with that? Listen to yourself. So defensive of what a 120hp can do. Why not 80hp? It can drive you around town too. It's not what a 120hp can or can't do. It's 1.8 million and 2 million for a 120hp. Does that even sound right? The fact is there's 160hp which they could have offered but didn't. That's the point. Well, if you bought one good for you. It capably drove you around the city. Honda's happy for you too. The question is... Have any of you guys actually driven one? The reviewer had. Mag comment kayo pag naka test drive na kayo ok? Looks lame when you see one on the road. Especially the rear. It only looked good on launch photo and brochures. Sorry to burst your bubble, but anything that's paid is clearly labeled as "ADVERTORIAL." This is a feature piece. And of course, if you took the time to read it you'll see that we did mention some things that could be improved with the CR-V.
LMAO 1.8m for this? Halos pareho lang naman sila ng power ng subcompact 700k diesel accent. Sir Uly, I would like to seek your honest opinion. I would like to get the S variant of Honda CRV. I and my wife are choosing between this and Toyota Innova G A/T variant. Would this be better than Toyota Innova? My wife likes the additional safety features of the Honda CRv? One other factor that is will the honda crv be good for the long run and practicality as a family car? Many thanks and hope to sincerely hear from you. IMHO, the Innova is still the most practical vehicle you can buy for our roads. Not only is the construction sturdy enough to take on those pesky potholes, but it's got good enough ground clearance (better than the 2WD CR-V) to take on flash floods. The ride and handling aren't as nice as the CR-V, but if you need a single everyday car, there's no faulting the Innova. Having said that, the CR-V is pretty comfy and interior is surely better built. It doesn't have the same space as the Innova, but its size is more manageable for our roads.